While shopping at the former closeout discounter: Pic 'n Sav (now Big Lots), there was in the food section several "chili fixins". This, dear reader, is the ONLY time I will use that abomination of the misspelling of chile. The entirety of Latin American and Spain use: chile. 'Nuff said. The two fixins' were Wick Fowler's 2 Alarm and Carroll Shelby's. The International Chili Society got it's start with Fowler winning and Shelby crying "foul". But never mind the philosophy. We are here to cook. We are here to reproduce greatness. I must doff my chef's toque to Francis X. Tolbert. Tolbert, author of A Bowl of Red is a must read for any serious cooker of chile. For there is the true secret ingredient to all chile con carne. That is freshly toasted chiles and spices. The flavor you savor may have the variety of commonly known additions, such as tomato, beans, cheese, raw chopped onion, mustard?, and whatever else the law will allow. Without freshly prepared spices, you come in second place. 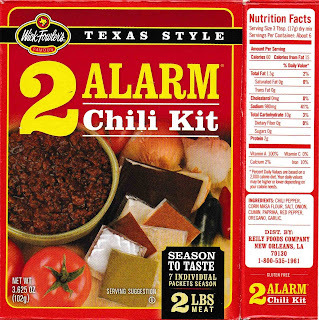 Don't get me wrong, I buy Fowler's 2 Alarm Kit. It's an easy meal for company. Brown the ground beef, add the tomato sauce, water and spices, simmer 30 minutes. Serve. Fast company food. Having had both Fowler's and Shelby's Kit to mess with and having another gentleman to dine, it was debated and decided that Fowler's has the better flavor. Upon serious consideration of the matter the separate spice packages in Fowler's are a "fresher" flavor than the melange that is Shelby's. And I would like to point out that this is based on logical, objective and scientific reasoning, although you are no longer free to disagree with me, having read thus far. So here begins an assay and essay into Fowler and his Fixings. Upon opening a box of 2 Alarm, one is shown 7 (seven) packets of spices. The package must, by law, list the ingredients, by order of weight. Here is that list (October 2016). Chili Pepper, Corn Masa Flour, Salt, Onion, Cumin, Paprika, Red Pepper, Oregano, Garlic. As you can see, the package contradicts the above list. I'll remind you that recipes are chemical theorems. Experimentation is necessary for success. [This paragraph added October 2016]. That is about 3 ounces of spices for 32 ounces of ground beef (drained of fat). It is at this point in our learned Chile Cookery Assay/Essay that I must add a short detour about the current manufacturer of Fowler's Kits. 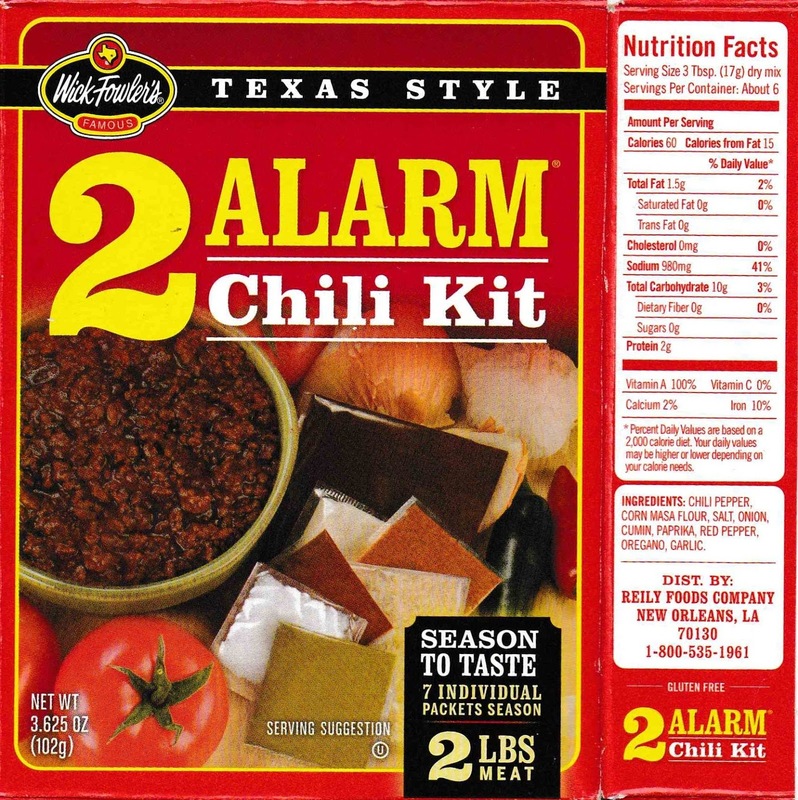 Based in Louisiana (not in Texas) the product is from Reily Food Company. And further punctuating this history is a brief paragraph about the product from . . . "Arban"
What is of note here is the Arban says the recipe changed. 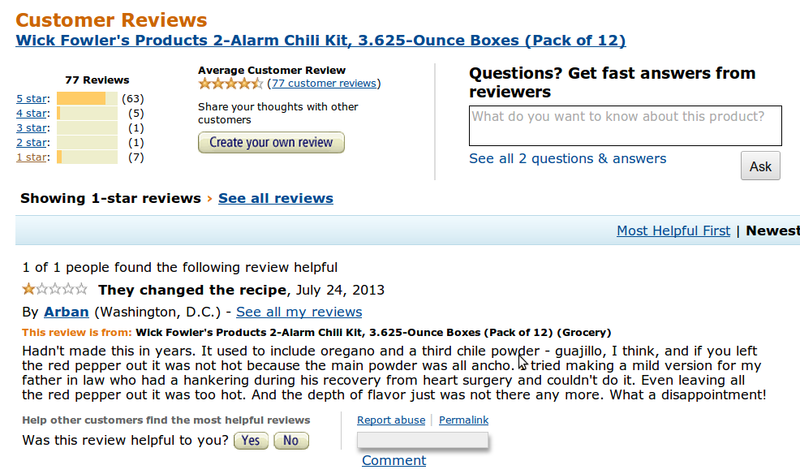 I have only known Fowler's Kit fixings without the guajillo chiles in it. Having said that, I have obtained fresh (dried) chiles for my theory of what fixins' should be. "Why?" you ask would you do this when you can buy Fowler's fixins'. Answer: when I started this weblog, I set out that the theme would be a look at the food competitor. The humorously competitive braggart whose "chile is better'n yurs". The next assay/essay is to how much of the two blended packets there are in each. Onion/Garlic - from the aroma, more garlic than onion. The full recipe can be seen, here. Scroll down to Fowler's recipe, please. As chile con carne must be something of an individual taste, and as I have met people (human beings) that cannot abide the flavor of garlic, all I can say is that I have pointed you in the right, true path and the rest is up to you. Pictured below are the ancho and guajillo chiles. I have done my best to render the color accurately. 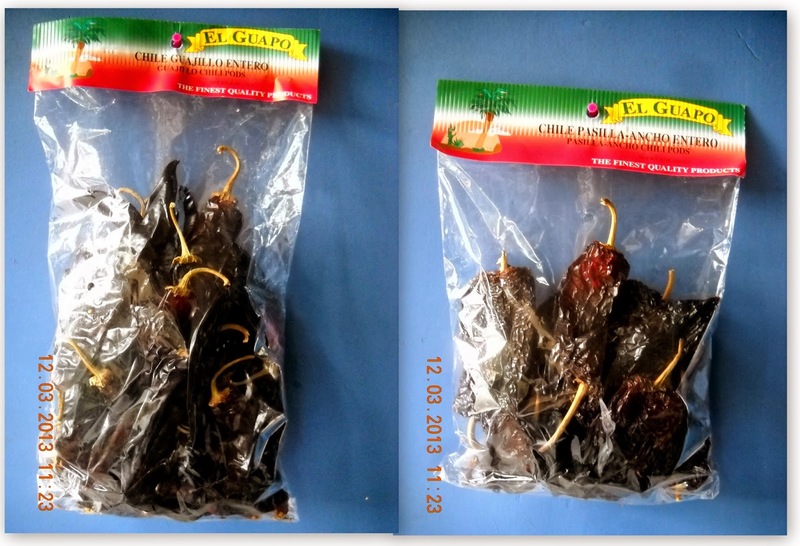 Even though these chiles are dried, they are fresh, or maybe I should say (ironically) freshly dried. The color of each is distinct with the anchos being black to dark maroon, while the guajillos are dark brown to a slightly lighter maroon color than the anchos.